I read this article and found it very interesting, thought it might be something for you. 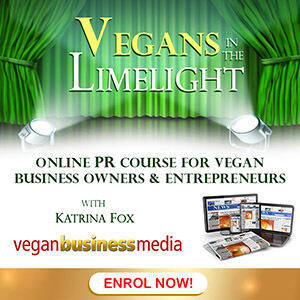 The article is called How to use Reddit to promote your vegan business and is located at https://veganbusinessmedia.com/how-to-use-reddit-to-promote-your-vegan-business/. 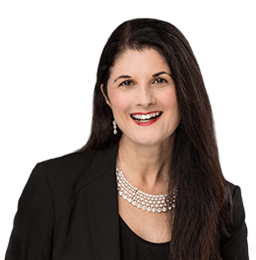 While Facebook, Instagram and other social media platforms are helpful to raise the profile of your vegan brand, you may be missing out by ignoring Reddit, writes Dale Cudmore. To many marketers, Reddit is scary. So while most recognize the potential of Reddit as a traffic source, they’re scared away from even trying to use it. 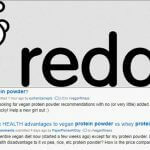 Personally, I’ve been a user of Reddit for years, and have used it to promote many projects, including my latest site focused on vegan fitness and nutrition. I’m going to peel back the curtains and reveal the exact numbers and approach that I take. By the end you’ll know if Reddit will actually work for promoting your content, and what to realistically expect. I’m going to assume you know the basics of how Reddit works and common site terminology (e.g. “subreddit”, “comments”, “threads”). If you don’t, read this guide first. The typical Redditor persona is a younger, tech-savvy person who despises anything related to marketing. And to an extent that’s true. But Reddit is a huge site, and I’ve found is that attitudes and demographics vary a lot between different subreddits. But there’s a huge difference when you go to subreddits about veganism. 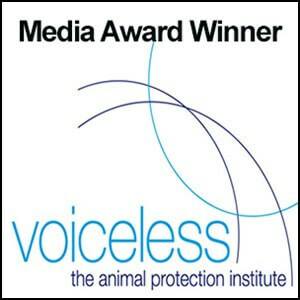 The people are much more positive and supportive of content that is made to help promote veganism. 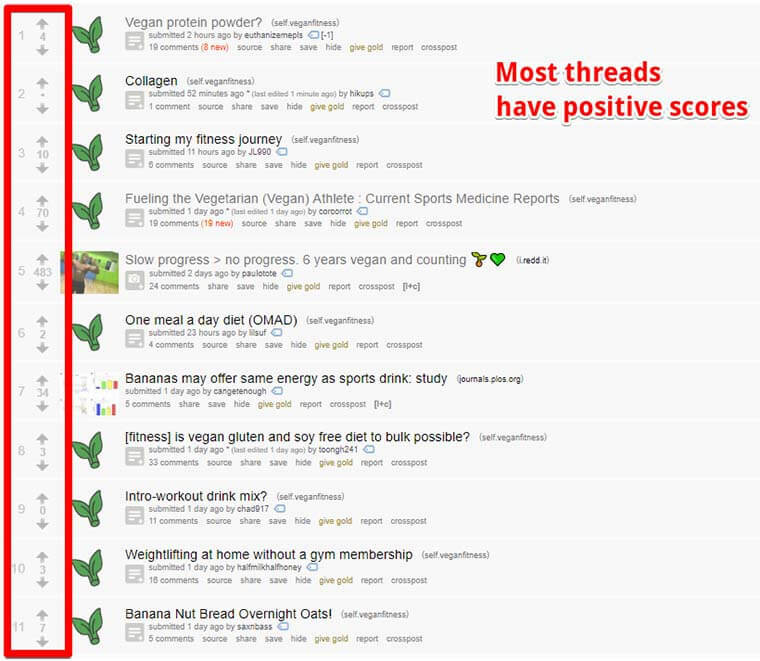 Even with just 35,000 readers in r/veganfitness, there’s a lot of engagement with threads. I’m going to walk you through the first Reddit post I made for my latest project, and then we’ll dig into the results afterwards. There is so much content that’s already posted and rated on any decent-sized subreddit. This makes it easy to spot popular topics that come up over and over again, and yet still generate discussion and get upvoted. Just spend some time reading through a subreddit’s post (especially the “top” ones that get the most upvotes), and you’ll start seeing patterns. 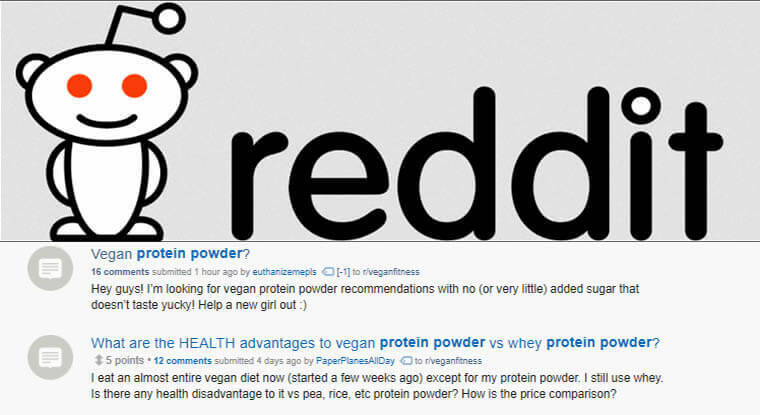 The first one I saw in the vegan fitness subreddit was that finding a vegan protein powder is a common issue (it’s one I actually had myself). I came back to these later on (more on this later). 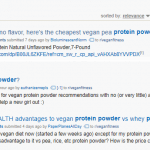 At the end of my research, I decided to create a really in-depth guide to the best vegan protein powder. I went all out to make it as useful as possible, taking months to buy and test several protein powders. It’s worth putting in extra effort when building content that you know you can promote again and again. 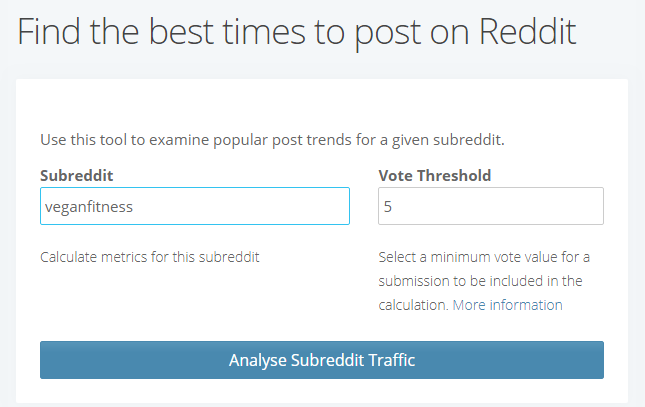 A small thing you can do to increase the number of upvotes and comments your Reddit posts get is to time it so that you post when your subreddit is most active. To do so, use Later for Reddit (free, no signup required). 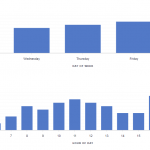 It will give you a few graphs showing you the best days of the week to make a post, and what hour of the day. 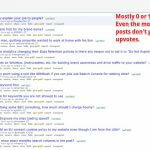 The tool looks at the top posts from a subreddit to see when they were originally posted. Each subreddit has its own rules and preferences. This lets me highlight the amount of work I put into my content, and address any potential questions right at the start. 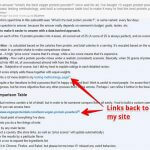 You also get to add more relevant text around any links that go back to your website. Instead of just slapping up the link, I put a lot of effort into making a good summary. This alone shows that you understand Reddit users and created something useful, and aren’t just trying to game the site for visitors. It’s important to be responsive in the comment section. Respond to most of the comments if you have anything to add. It shouldn’t need to be said, but don’t be rude in comments. If someone makes a snarky comment, just don’t reply if you feel you’re going to be negative. Most of the time the downvotes will move those comments to the bottom anyway. Up to this point, I haven’t done much promotion to the site, which was brand new (well a month old) at the time of my first Reddit post. That gives us a unique chance to really see the impact of Reddit. 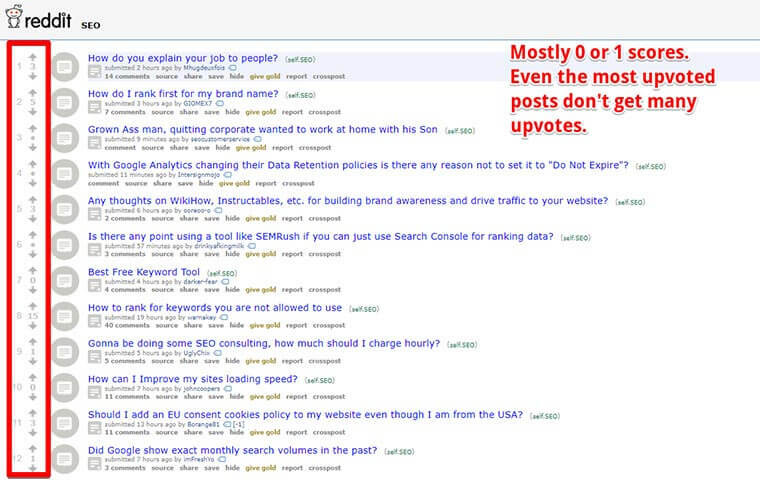 Keep in mind that if a post gets a lot of upvotes, it appears on subreddit pages for the top posts of the month, year, and all-time. These pages are generally really authoritative. 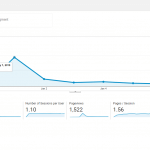 Moving on, let’s break down the on-site results one at a time. I received 465 users on the first day, and that number quickly declined afterwards as expected. However, I still had a steady 30+ users per day, even a week after when it had fallen off the subreddit front page. As you can see, I had 884 new users over the first week of the post being live, almost all of the from Reddit (either as direct traffic or referral traffic). That’s due to traffic from those subreddit pages for the top posts of the week, month, etc. Unfortunately, other than being shared on Reddit, my page wasn’t shared much on other social networks. Looking back, this makes sense. If someone finds content they like on a social network, they “like” or upvote it there. There’s no real reason for them to share it elsewhere. 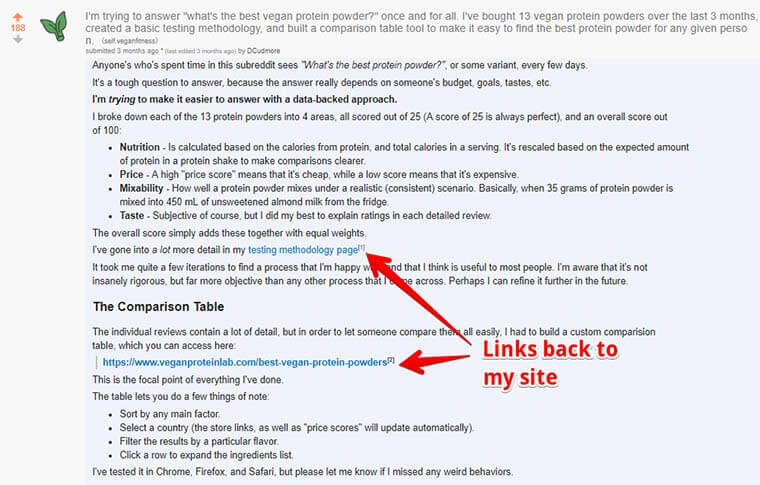 Just like with social sharing, Redditors don’t link to content they like from other sites. This may vary depending on the subreddit, but I’ve never acquired many natural links from successful Reddit posts. I know for a fact that Ahrefs is missing a handful, but none that were derived from my Reddit post as far as I can tell. The post had a fantastic effect for ranking for a reasonably competitive commercial term. It rose from position 30 to position 5 about a month after the Reddit post. I did no other SEO work during that time. My rankings have declined a bit since then, but still fluctuating around the bottom of the first page. Is Reddit traffic high quality? 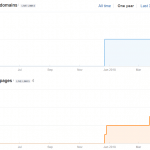 I posted right on January 1, and it led to quite a few sales immediately as an Amazon affiliate. Unfortunately, there was a mixup and my account was rejected, so I had to start from scratch a week later. 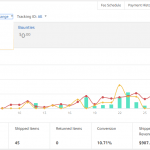 This residual traffic that kept coming in still led to a 10.71% conversion rate (on clicks to Amazon), and about $42 of earnings in that first month. Sure, I did it once. Does it work twice? Three times? Reddit always has some variance, but I’ve seen remarkable consistency in small to medium-sized subreddits. Remember those other topics that I saw during the ideation phase? 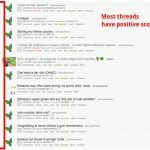 After my first post, I created content around those topics and posted them to various relevan vegan subreddits. There were no “failed” posts in that time frame, each one did very well on its own. If you follow all the key points that I laid out earlier, I see no reason why Reddit couldn’t be a valuable traffic channel for you. Reddit is not the perfect marketing channel, but it can be a very good one if you truly create useful content. 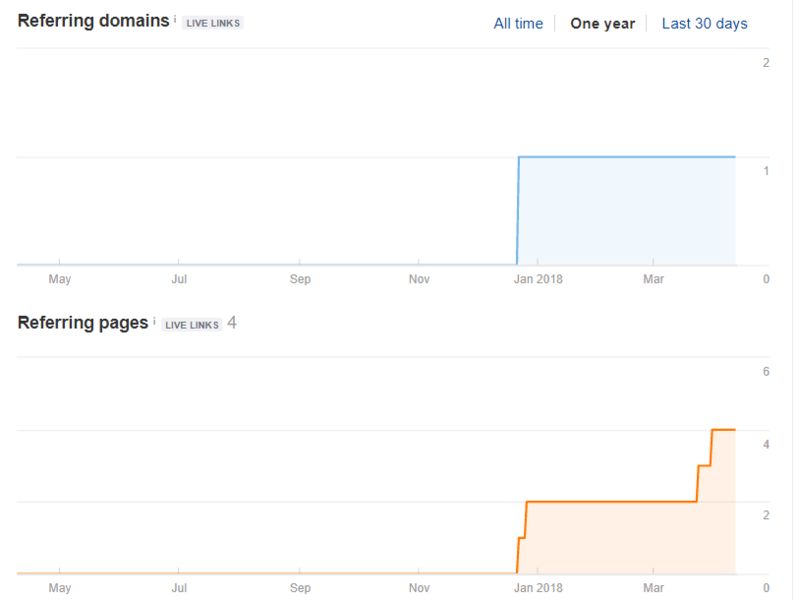 Based on the results I’ve shown you, it’s clear that Reddit is not a good platform if you’re trying to build natural backlinks (beyond links from Reddit itself), and if you’re trying to get social shares on other social media sites. Traffic – There are sizeable Reddit communities for just about every niche. 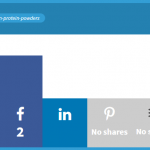 Feedback – You get direct, actionable feedback that you can use to improve your content further. 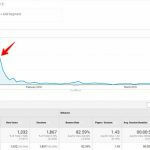 SEO impact – You may not get a ton of links from a successful Reddit post, but it will still see some impact, especially for low competition terms. I’ve been as transparent about this as possible, I really hope it helps you succeed on Reddit. If you have any questions, feel free to get in touch with me and I’ll try to answer them. 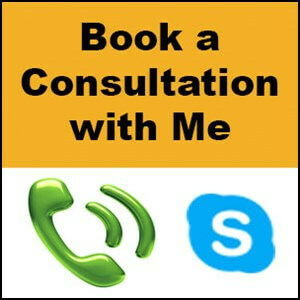 Dale is a professional freelance writer, specializing in digital marketing and technology. 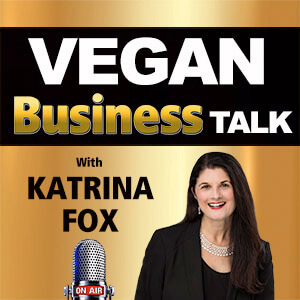 He also happens to be vegan and loves to support and help vegan businesses grow. Find out more at his website.